The Air Knife - Air-Blade Blow-Off System from Nex Flow™ is easy to install and maintain. It can reduce both compressed air consumption and noise levels. Air Wipe Blow-Off System - X-Stream™ Ring Blade™ from Nex Flow™ is easy to mount and maintain and reduces both compressed air consumption and noise levels. Designed for use up to 400°F (204°C) It produces a "laminar" flow of air along its 360º angle using the "Coanda" effect which "entrains" a large volume of air from the surrounding area along with the small amount of compressed air from the Ring-Blade™ air-saver wiper-blade to produce an output flow up to 30 times. Air Wipe Blow-Off System - X-Stream™ Ring Blade™ pay back on compressed air savings can be as soon as a few weeks in some applications when compared to nozzle "rings" or simple annular slots used by other air wiping system. Blow-off, cool & clean items like pipe, cable, wire and hose with the Air Wipe Blow-Off System Ring-Blade™ from Nex Flow. 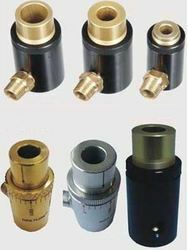 Air Nozzles – Is made adjustable. The superior design of the adjustable set screw is made to adjust the nozzles within its weakest and strongest ranges. Air Jets are larger than nozzles and used when a wider area needs to be hit with the amplified air. 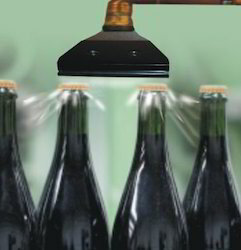 They are significantly more efficient than nozzles although often use as much compressed air. 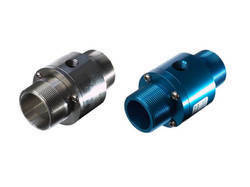 Their best use is to replace pairs of nozzles that are used for part ejection or for blow-off applications that require greater force than that provided by air knives or air movers. Nozzles are for point use while air jets can fan out somewhat for better continuous blow-off when a row of them are made. Nex Flow™ air jets are all made adjustable with a lock ring to assure the security of any gap setting. 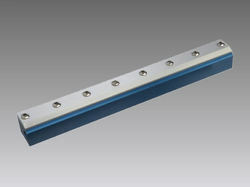 They have a female 1/8" NPT and made lightweight with anodized aluminum. If you need an air jet selection guide, simply contact one of our technical support personnel at Nex Flow™ or at our regional sales and engineering offices worldwide. 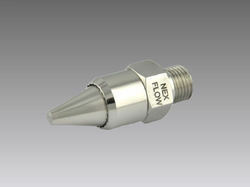 The Nex Flow™ High Force Air Jet is also a High Velocity Air Jet. All the air jets are adjustable. With an Adjustable Air Jet the flow and force can be set and "locked" in place with the lock ring for your particular application. Flat Jet is an extremely efficient flat jet air nozzle designed to provide a powerful stream of high velocity laminar flow and high force for blow off and cooling where air knives may not be enough. 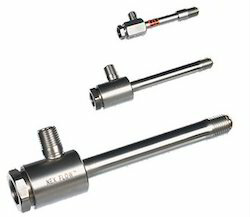 Available in standard and threaded versions for regular and high temperature applications. Air Conveyors - Ring-Vac™ Pneumatic Conveying System is available in both coated aluminum or high temperature stainless steel. Simply clamp a standard hose size to each end of the Ring-Vac™ to create this high energy conveying system. No moving parts for maintenance free operation with capacity and flow controlled with a pressure regulator. Air Conveyors - Ring-Vac™ Pneumatic Conveying System is available in 3/4"(19mm) 1" (25mm), 1-1/4" (32mm), 1-1/2" (38mm), 2" (51mm) and 3” (76mm). Any size beyond that can be prohibitive for most applications due to high compressed air requirements. Beyond 3", the vacuum ability begins to drop significantly except for highly intermittent applications. For applications beyond 3", a blower system often becomes far more economical except in a rare number of possible applications. However, larger size versions are available if required as well as special sizes. The anodized aluminum and high temperature stainless steel Ring-Vac™ Air Conveyor can convey all types of solids in large volumes over great distances with no moving parts. Stainless steel Ring-Vac’s™ are available in 303/304 stainless and in 316L stainless steel for highly corrosive and for food and pharmaceutical applications. Available in Three sizes with a wide range of cooling capacity and temperature range.